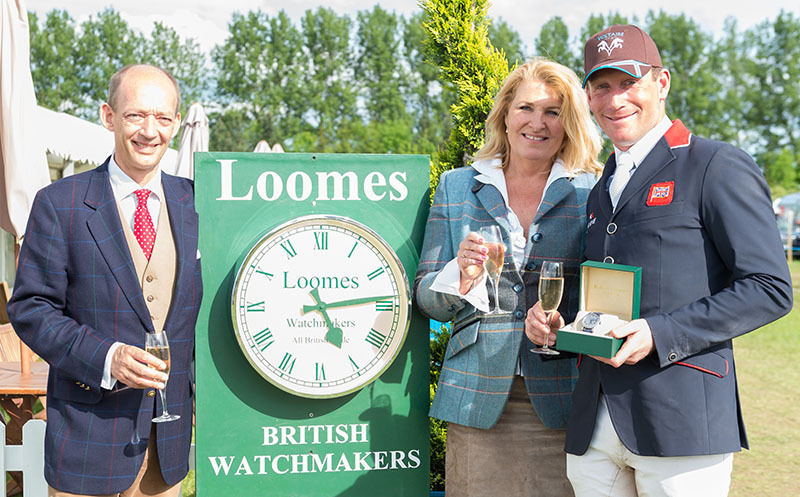 Oliver Townend became the first British winner of the Loomes Championship, for the combination coming home closest to the cross country optimum time in the open intermediate and advanced intermediate sections. Oliver brought Ludwig Svennerstal’s Coldplay III over the finish line one second inside the 5:43 time en route to winning the open intermediate on his dressage score of 27.5. It was a closely fought Championship, however; Tim Price, winner of the advanced intermediate on Cekatinka’s 23.3 dressage score, was two seconds inside the time, and consequently missed out on the prize of a handmade English watch, worth around £8,000. “This prize is a fantastic incentive for riders, and part of the reason why I came here. To win something of this value at intermediate level is pretty much unheard of,” said Oliver. Open intermediate runner up Andrew Hoy riding Cheeky Calimbo was also in with a chance of winning the watch but came home three seconds inside the optimum, while Oliver’s third placed ride Ballaghmor Class was one second over the time. Pippa Funnell rode two horses into the top 10 in the Advanced Intermediate. Sandman 7 placed second and MGH Grafton Street seventh, while Aoife Clark took third on Colorfast II. Vendredi Biats has yet to finish outside the top 10 this season, and followed an open intermediate win at Aston-le-Walls last time out with a Two Star win here under Kitty King, beating runners up Jonty Evans and Alamo by almost 10 penalties. James Avery claimed the other Two Star with Zazu, also with a comfortable margin of over five penalties. It was to be a weekend filled with bridesmaid placings for Piggy French; second behind James on Jump Jet III, second in the One Star on Big Berry, and second in a novice section on Jennifer Saunders’s super smart Cooley Monsoon. Piggy did post a win on Fernhill G, however, in a BE100. Andrew Nicholson’s run of form continues; he provided another win for Deborah Sellars, owner of both Nereo and Rockingham’s six-year-old CIC1* winner As Is. As Is was one of just three horses to complete on his dressage score, the other two being 14th placed Katie Barber riding Don Meeco and 17th placed Eliza Stoddard and How Bazaar. The straight intermediate sections resulted in wins for Holly Woodhead on Finduss PFB and Izzy Taylor on Monkeying Around, while Greta Mason took the Under 21 Open Intermediate with Chillout Girl. Local riders might not have featured strongly in the International or intermediate classes but they dominated Friday’s national classes. JP Sheffield got the home side off to a great start claiming the opening national class, a BE100, riding Electric Lux. Close behind JP was Lucy Kemplay on Bleannagloosanimo, Lucy also picking up a third place in a different section with Greyford Boy. Zara Heathcote denied Lucy her second runner up spot, posting a two point advantage over Greyford Boy riding her own Martha Imp. The final BE100 section also produced another local winner in the shape of Sophie Icke with Think Tank Think. Local success continued with the Novice competitors. Angus Smales from Alexton and Katie Barber from Queniborough were the 1-2 finishers in the first class at this level, riding Eastern Gold II and Daytona Dreamer respectively. The final winners of the weekend, who collected their prizes under blue skies and bathed in sunshine, were William Fox-Pitt with Shannondale Percy – still on event due to a lengthy but luckily successful search for a missing dog, Wymeswold based Lauren Shannon riding Rinneen Silver Rocket and Lucy Bullas who claimed the open novice on Master Jack III. The team at Rockingham had their work cut out with heavy rain on both Wednesday and Friday. The volunteers and tractor drivers undoubtedly kept the show on the road and everyone smiling.